The RAPCO PN. RA-VAC MEASURE KIT is an inspection kit used to help determine when a dry air pump should be replaced. 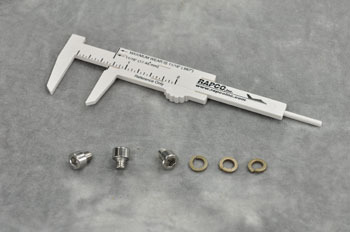 The kit comes with a caliper to measure vane wear, along with three extra cap screws and three extra lock washers, which are used to seal the inspection port found on all new RAPCO dry air pumps. This kit is designed to be used in compliance with RASL-006 or in the event one should lose the cap screw and/or lock washer during an inspection.